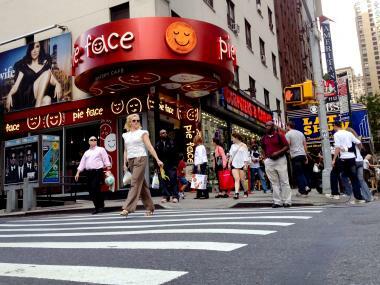 Pie Face, the Australian pastry shop at 53rd Street and Broadway, plans to open several other locations in Manhattan in the coming months. MIDTOWN — After several successful months of selling meat pies in Midtown, a popular new eatery rooted in Australia is looking to expand throughout Manhattan this summer. The restaurant Pie Face, named for the hearty meat- and fruit-filled pastries that boasts two frosting eyes and an icing smile, will open two new stores in the coming months — Seventh Avenue between 35th and 36th Streets and East 34th Street at Third Avenue. The Aussie original opened its first New York location on 53rd Street and Broadway in January. The eatery is planning to open an additional three stores in the city by end of 2012, though those locations have not yet been revealed. "It's doing very, very well," said co-founder Betty Fong, who spends nearly every afternoon working at the Broadway location when she is not in Australia tending to her other 75 Pie Face locations. 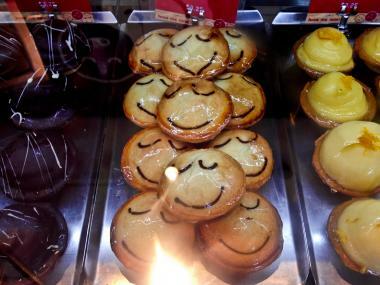 An array of pastries sold at Pie Face, the Australian pastry shop at 53rd Street and Broadway that plans to open several other locations in Manhattan. "We have a lot of regular customers, which is good, and we've had a lot of email feedback from around the country. It's all been very positive." Wayne Homschek, co-founder and CEO of Pie Face, said the popularity of the pies is due to the company’s original take on an old favorite. "Meat pies are not totally unknown, but it's the quality and the quirkiness of the brand, like the faces on the pastries, that make the product unique," he said. But it’s not just meat pies that are the selling point, Homschek said. Sandwich sales have jumped twofold since the store introduced new options on the menu this week. And more patrons continue to frequent the store for its fresh-pressed coffee, he said. Homeschek said that Pie Face, which is open 24 hours a day, seven days a week, will continue to reevaluate its business plan over the next year in hopes of expanding to other locations throughout the city. Editor's Note: The original version of this story incorrectly gave the future addresses for Pie Face as West 36th Street and Ninth Avenue and East 34th Street and Third Avenue due to an error by the comapny's press representative.